It was such a fun last month of winning that even the Philadelphia 76ers' losses have been pretty quickly forgivable. It's been a lot of Oh the Wizards Just Made Shots or Oh Dwyane Wade Just Went Off or Oh We Just Didn't Have Embiid -- losses because all teams must lose on occasion in the NBA, not because the Sixers truly deserved an L. For the last one of those, you have to go back to late January in Brooklyn, or maybe a couple weeks earlier against Boston overseas. Well, regardless, reset the "Days Since..." calendar on that one. The Sixers blew a huge lead not once but twice against the Milwaukee Bucks, exploding early but partially falling apart in the second quarter and then completely unspooling in the third, as the team ended up scoring more in the first quarter (43) than the entire second half (38). The Bucks surged behind MVP candidate Giannis Antetokounmpo (35-9-7), and sped away to a 118-110 victory. It was the first time in recent memory that the Sixers just seemed... well, young. This wasn't the team that outplayed the Cavaliers down the stretch, or the one that calmly took care of late-game business against the Hornets. This was the team that couldn't be trusted with a second-half lead against anyone, the team who forgot how to execute when the pressure was heightened, the team that let frustration get the better of them -- the team that went 0-2 against the Sacramento Kings. Haven't missed 'em, gotta say. It's hard to say exactly what happened in this one. We can probably start with it being Joel Embiid's worst game of 2018: 19 and 8 on good shooting, sure, but seven turnovers -- tying a season high -- while increasingly losing his composure over the course of the third and fourth quarters, forcing passes into traffic, making bad reads, and attempting to draw fouls that weren't there. He wasn't the only one: Ben Simmons and J.J. Redick also combined for 11 turnovers, and the team combined for 26 altogether, an impressive season-high. The Sixers were also putrid on the boards, only grabbing 26 defensive rebounds all night, while the Bucks got 16 off the offensive glass. Of course, it's worth pointing out the Sixers are, in fact, a young team. Playing in late-season games with playoff implications is still very much new territory for Embiid, Simmons, T.J. McConnell, Robert Covington and Dario Saric (the latter being the one guy who basically gets a pass for last night, with his 25 points on 9-11 FG and just two TOs). The veterans didn't help them much last night, but it's not their team -- it's on our young core to leads us through the team's most meaningful games, and even though they've been up to the task for most of the last couple months, they're still prone to the occasional stumble like this. It's probably a necessary hosedown for those of us who'd already started daydreaming "well, maybe they can get to the three seed... and then it's a bad matchup for the Celtics in round two... and then in the conference finals, who knows?" Probably not this year, all told. Still, it's a bad loss, but it's nothing the Sixers can't make up for. They're on the road this week, but with three highly winnable stops in Charlotte, Miami and Brooklyn, and then it's home for 11 of the team's final 17 games -- including a chance for revenge in the season closer against Milwaukee. And even with the loss, they remain a half-game up on Milwaukee in the sixth seed, still with just two games separating them from Cleveland at three. Plus, that's game number 82 for Joel Embiid -- a full season, and as many games as Greg Oden, the catastrophic injury bust that Joel would most frequently get compared to as his worst-case scenario, ever played for the Portland Trail Blazers. 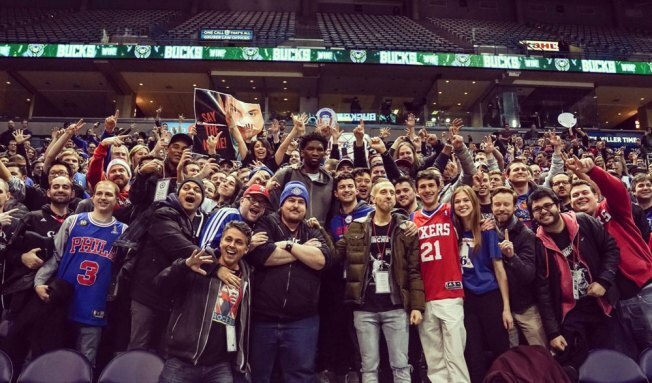 And even after a poor performance in a bad loss, Embiid still came out after the game to hang out with the Rights to Ricky Sanchez crew that made the trip from Philly just to avenge his Rookie of the Year snub by booing Tony Snell (as proxy for the injured Malcolm Brogdon) -- making their presence felt enough for Giannis to golf clap 'em after the game. Hopefully that's what all concerned will remember from this one when this regular season is in the rearview.